Leverkusen - Bayer 04 Leverkusen produced a dominant display to further their top-three push after beating FC Bayern München 2-0 in Matchday 31's Saturday evening showpiece. After a tense first half, in which Mario Götze missed a golden chance, Hakan Calhanoglu's wonderful free kick put Leverkusen in the ascendancy ten minutes into the second period. The opener allowed Roger Schmidt's side to hit Bayern with numerous counterattacks, and birthday boy Julian Brandt added the second in the closing stages. With Pep Guardiola rotating in seven positions after securing the Bundesliga title last weekend, it was perhaps no surprise when Bayern made a slow start. Although Mario Götze, cutting inside, tested Bernd Leno in the sixth minute, it was the hosts who made the early running, with Stefan Reinartz volleying over and Stefan Kießling’s tenth-minute header correctly adjudged offside. 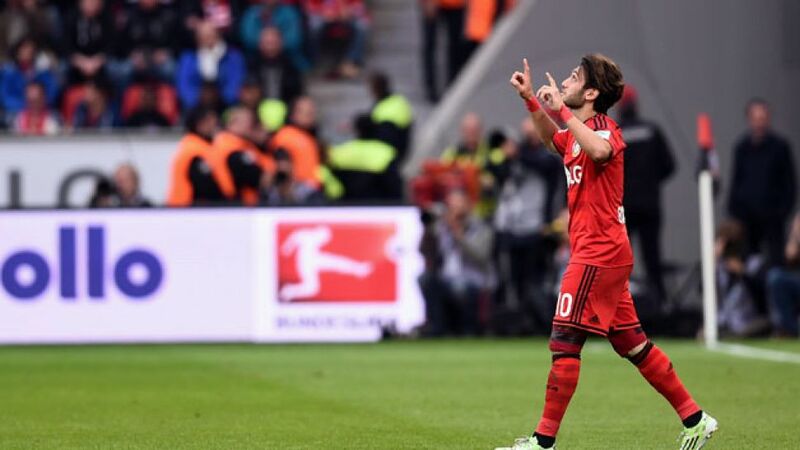 However, once Bayern had settled defensively after the quarter-hour mark, die Werkself remained on top but struggled to create further chances, with Javi Martinez imposing on his comeback from injury. Indeed, while not at their scintillating best, Bayern were resolute and enjoyed the best chance of the first half in the 27th minute when Götze beat the offside trap to round Leno, only for his weak shot to be cleared off the line by Tin Jedvaj. The Croatian was involved at the other end in the 35th minute as Leverkusen attempted to turn regular set-pieces into chances, but the defender could only fire Calhanoglu’s inch-perfect cross over. Heung-Min Son was next to try his luck, drawing a good save from Manuel Neuer, while at the other end, the closest Guardiola’s side came after Götze’s earlier chance was a blocked Rafinha effort and a harmless Philipp Lahm free kick prior to the interval. Bayern were, however, first to threaten after the restart. Turning his marker, Claudio Pizarro’s low shot was blocked by an onrushing Leno, although the hosts responded well when Simon Rolfes’ header tested Neuer. The visiting custodian was helpless in the 55th minute when Calhanoglu bent a trademark, swerving free kick past him to give the hosts the lead, and was almost beaten again three minutes later when forced to scoop the Turkish international’s corner off the line. Unusually passive after going behind, Bayern struggled to create any clear-cut opportunities. Bastian Schweinsteiger’s 64th-minute free kick deflected wide, while Rolfes again tested Neuer at the end of a brilliant Leverkusen counter. The entrance of Thiago, and his unflustered passing, ensured the visitors finally began to enjoy a protracted spell of possession in the hosts’ half, and Lukas Görtler was denied a dream debut by another excellent piece of goalkeeping from Leno. The home custodian was again required in the 76th minute to deny Götze’s effort from close range, but it was to prove his last involvement, as Leverkusen continued to attack Bayern on the counter. Son’s shot deflected off Dante with ten minutes remaining, but a minute later, Brandt provided a superb finish to Karim Bellarabi’s powerful run, and Roger Schmidt’s side ended with a minimum of fuss to inflict only a third league defeat of the season on the champions.